A student moving to campus from across the country, or a relative coming for a visit, may be concerned about getting to and from campus, as well as exploring local points of interest. This fear of isolation is especially true for students who come to college without a car--and less than half of American college students bring their cars to college with them. Students need reliable taxi services to help them navigate on and off campus. Part of the charm of Otsego County is its wonderful scenery, but this lovely experience comes at a price: the planes and trains don’t come into Oneonta. While there is a bus station, there is something to be said about driving in private car, versus public transportation. Students and visitors to SUNY Oneonta and Hartwick College often fly into the airports at Albany or Syracuse, or even into airports around New York City. Landing at the airport is far from the end of your journey. In many ways, it’s the beginning, as you or your student will need to reach the campus, which - depending on your point of entry - can be another 3 hours away. That’s where we come in. Absolute Taxi offers transportation to and from Albany International Airport, Syracuse Airport, the Albany-Rensselaer Amtrak Station, and the Albany Bus Station. It’s a comfortable and hassle-free solution for students who want to get home for the holidays, or for parents who can’t wait another second to hug their child. A big part of Oneonta's appeal is that it is a small town, offering all the things you value about small town living. 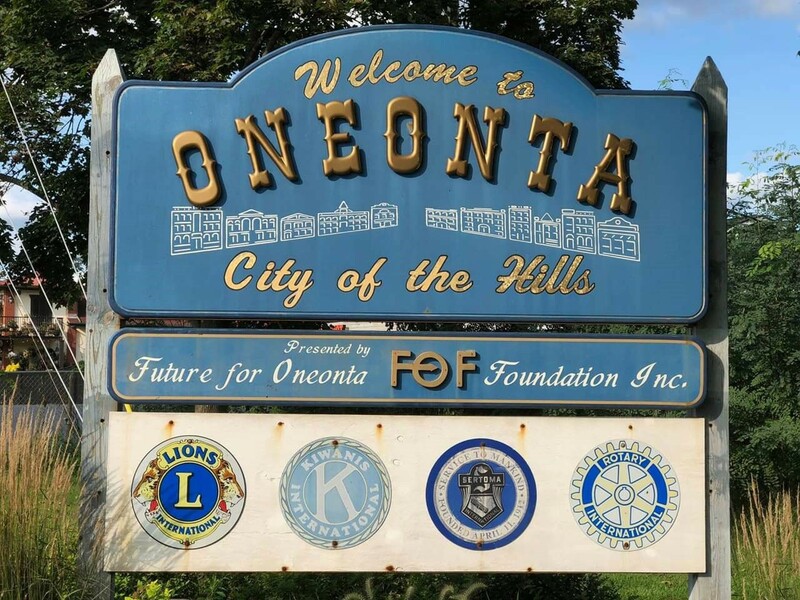 Oneonta is a safe town, with a charming Main Street area offering great cuisine, a farmer’s market, niche shopping, and tons of cultural institutions. It’s also a beautiful place for outdoorsy activities, such as running, fishing, hiking, and, of course, enjoying winter activities. Also, there’s a yearly hot air balloon festival, which is pretty groovy. But what happens when students will want to explore, having seen most everything that interests them in the City of the Hills. Fortunately, we’re surrounded by other cities, which are great for weekend getaways. While there is a shuttle bus from the campuses into Oneonta, sometimes students may want to go further and see some other sights. If they have a car (and remember, most students don’t) they may want to drive for a day trip to Cooperstown, for instance. Cooperstown, which is only 20 miles away and is an amazing place for baseball fans. It houses the National Baseball Hall of Fame and Abner Doubleday Field. For those interested in the liberal arts (after all, you are going to SUCO and Hartwick, right?) there’s the Fenimore Art Museum, and Glimmerglass Opera, and the Farmer’s Museum. In short, it has something for any college student’s interests. Sounds great, right? But there’s no denying that parking can be a hassle. It’s unfortunately scarce in Cooperstown, and those two-hour time limits are strictly enforced. Hiring a taxi service may be the most pain-free option and may turn out to be cost-effective - especially if a group of students splits the cost! A major safety concern for many colleges involves students and alcohol use. In fact many institutions prohibit the consumption of alcohol on campus, regardless of the age of the students. This means students of legal age will often go off campus to be with their peers. Researchers estimate that 1,825 college students die each year from alcohol-related unintentional injuries, including drunk driving. Rather than rely on a DD (who may not be reliable) or walk all the way to a shuttle stop, only find it shut down for the night (shuttles don’t run 24/7)), it’s much wiser just to call for a cab. A reputable and reliable cab service can make all the difference between a student getting safely back on dorm or having to rely on good fortune to avoid becoming just another statistic. As the area’s premier taxi service, Absolute Taxi understands the needs of students who attend our local institutions and the anxiety of their families as they transition to the next phase of their lives. Our goal is to help the transition go as smoothly as possible. Our services - including our airport transportation services - are reliable, affordable, and personalized to your individual needs. Don’t let lack of a car or the distance to the airport or Amtrak be a deterrent for visiting your child or for your child coming home on the holidays. Let Absolute be the first name you think of when it comes to transporting your student where they need to be on time, every time.